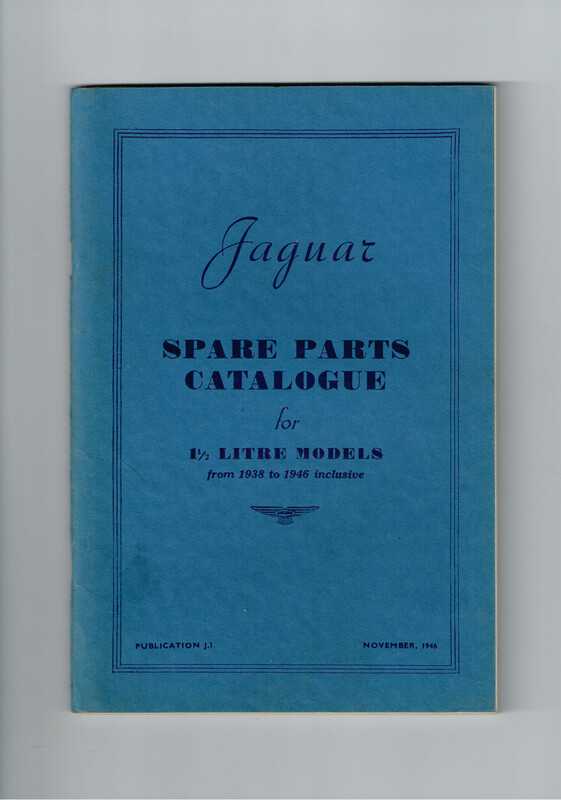 Does anyone have a Pdf copy of the Spare Parts Catalogue, which includes the 1948 3.5L MKIV, they would be willing to share with me? Tried but the file is too big to send via jag-lovers. Let me know your email and I will send it to you. The 3-1/2 litre Spare Parts Catalogue is publication J.3 and was published in December 1947. So you need to also get a copy of the J.3 Amendment List No.1 (the only one published) comprising some 18 sheets that updates J.3 to cover all 1948 cars as well. If Rob’s J.3 .pdf doesn’t include J.3 AL.1 I do have an original, but can scan/email to you. It did include Amendment No. 1, which is a lot of "Delete part no.s, alter remarks, alter quantity, superseded by, etc. Just curiously, was there an amendment list for the 2-1/2 Litre? Thank you very much Rob. I’ll have a good look at it tonight. 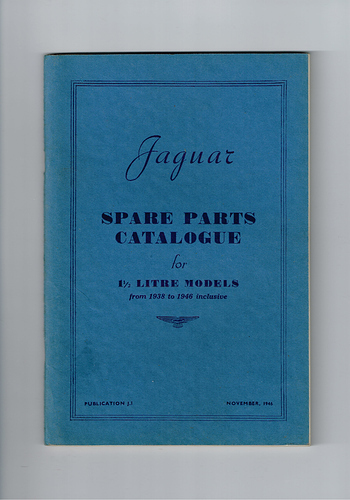 The 2-1/2 litre Spare Parts Catalogue J.2 was published in August 1947, and was updated by two Amendment Lists - J.2 AL.1 comprising 8 sheets, and J.2 AL.2 comprising 10 sheets. 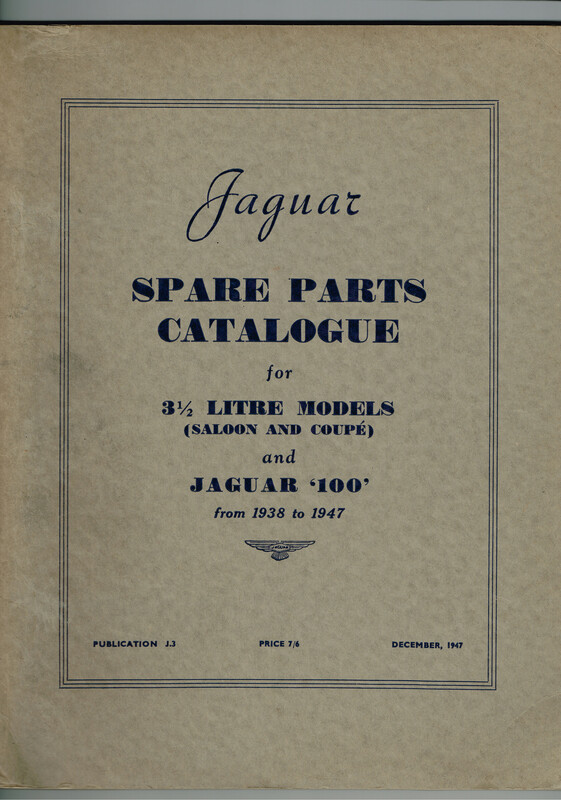 The 1-1/2 litre Spare Parts Catalogue J.1 was published in November 1946, and was updated by two Amendment Lists - J.1 AL.1 comprising 22 sheets, and J.1 AL.2 comprising 8 sheets. Despite the obvious differences between 1-1/2, 2-1/2 and 3-1/2 litre cars I find it useful to have all three (plus ALs) when researching specific matters, as publication dates show subtle variations. These J.1, J.2 and J.3 retrospectively cover 1938 to 1940 SS Jaguar, RHD only of course, and both RHD and LHD postwar ‘Mark IV’ but need the Supplements to cover the last built. 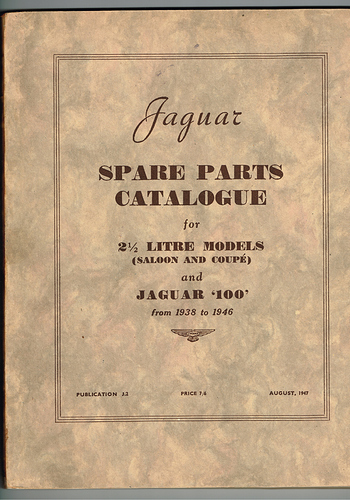 There is also a JS.100 booklet of Jan 1948, being a Supplement to J.2 and J.3 covering just SINGLE HELICAL GEARBOXES. 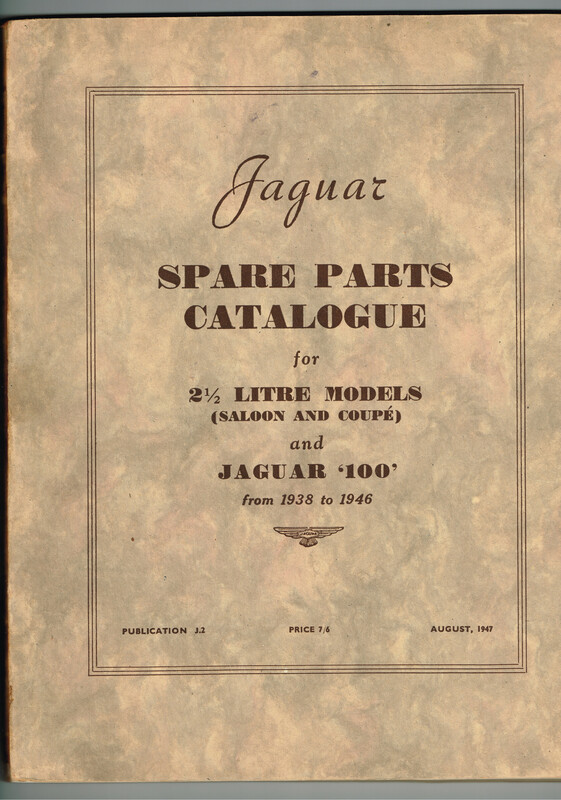 There is also a J.5 published in Oct 1948 that covers LHD only 1-1/2 litre Saloon and Coupe, and a J.6 published Nov 1948 that covers LHD only 2-1/2 litre and 3-1/2 litre Saloons and Coupes, both with no updating Amendment Lists. These J.5 and J.6 given their late publication dates, albeit limited to LHD, do not cover pre-war SS-Jaguar of course, just postwar ‘Mark IV’ in a consolidated format. I have never identified any J.4, but going by Publication Dates could either be the intended numbering of JS.100, or possibly the original issue of the Master Price List given J.12 is the second edition. Would love to know for sure, similarly haven’t conclusively identified J.17. Does anyone have a copy of the J1 spares book (and amendments) for the 1 1/2 they could kindly let me have a copy please - it would greatly help me in my restoration work. I do not have J.2 AL.1 nor AL.2 but I suppose they only relate to the '48 cars or LHD? I have the SH&JH Gearbox Supplement but mine does not seem to have a J number at all. Perhaps I am missing a page or two. David, do you have RHD or LHD? Let me know your email address. J.2 was published in August 1947, and is thus up-to-date until only then. It covers all 2-1/2 litre 1938-1940 SS-Jaguar (including SS100) all RHD retrospectively, and 2-1/2 litre 1946-1947 RHD and LHD. J.2 AL.1 and J.2 AL.2 are undated, but cover all changes/updates subsequent to Aug 1947, so include all 1948 changes up to and including the last 2-1/2 litre built - with any post end of production changes best checked within the initial series Spares and Service Bulletins. J.2 AL.1 comprises 8 sheets, some single sided, rest double sided according to their purpose. Section 1 is double sided sheets, where the recipient was expected to hand amend the master J.2 catalogue with the exact text/part number change advice. Section 2 is single sided sheets where the recipient is expected to cut out each amendment and paste over the top of the original J.2 now obsolete information. All these amendments can and do affect areas covering 1938-40 SS-Jaguar as well as 1946-47 Mark IV, both RHD and LHD. J.2 AL.2 comprises 10 sheets, but otherwise same logic as AL.1. My J.2 and both J.2 AL.1 and J.2 AL.2 are ‘as-new’, so no efforts made to update/amend the J.2. As you are aware J.2 and J.3 are perfect bound, with the spine glue somewhat brittle with age, so I have never scanned these two not wanting to break their binding. (Flexible enough to carefully open, but not held open and flat on a scanner) The AL.1 and AL.2 are individual sheets stapled in corner, so am happy to carefully remove staples and flat scan both sides. J.1 is stapled and can be easily opened out/flat and scanned, but I have never found the need. Having said that, if you do have J.1, J.2 and/or J.3 scanned, can you please email them to me. Actually if anyone is interested (contact me privately), I have spare originals of both J.2 including AL.1, and J.3, but would need to check condition and status, this detail not being recorded on my 'Spares" spread sheet. I should have a spare original J.1 in exc condition as well, but couldn’t find it when looking six months ago. See attached pics of my J.1, J.2 and J.3. J.1 (and J.5) are both unusually for SPC only Handbook size.